Fermier’s goal is to bring delicious cheese to the people of Japan. It has succeeded at this for almost 30 years. In shops and online, at least 200 kinds of fresh, aged, and seasonal cheeses from Europe and across Japan are sold around Tokyo. Fermier operates under the belief that cheese is “a gift from God” and treats it as such. Started by Rumiko Honma in 1986, Fermier has grown into three cheese retail shops and a cheese-focused cafe. The main shop in the neighborhood of Atago has its own cave d’affiance to ensure that all cheeses are at peak ripeness for customers. Fermier hosts regular events in the beautiful salon of the Atago shop and in the cafe in Azabu-Juban. Come by for a fondue lunch, wine pairing lecture, cheese with aperitif, or join a collaboration with a local restaurant. There are so many opportunities to learn about cheese and practice your Japanese if you’re not a native speaker. 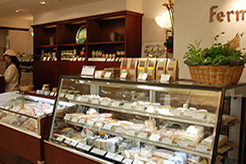 Fermier organizes seasonal tours around Europe and other cheese locations for Japanese customers who want to learn more about the cheeses they buy from Fermier. Locations have included cheese centers like France, Italy, Switzerland and Italy as well as Corsica, England, and Spain. Besides cheese, the shops sell books on cheese, cheese knives, cutting boards, and artisan products like honey, dried fruits, and organic tomatoes imported from Italy. All your cheese accompaniments are there as well as ideas for cheese gift baskets. With a membership, customers receive discounts on all purchases and events. It’s also easy to order cheese online. Check out the shops in Atago, Shinagawa Station, Shibuya Station, and the cafe in Azabu-Juban for a wonderful cheese experience. Access: Located up the hill behind the Atago Shrine. Access: Located on cobblestone street facing a stationary store. Access: Located in the basement in the Tokyu Foodshow. Access: Located in the Ecute shopping area inside the station.